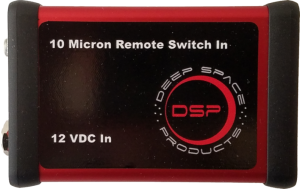 Deep Space Products’ small electronic relay switch is designed specifically for remotely turning a 10Micron mount on and off. The switch requires a 12-volt AC/DC power supply (low-amp is fine) and a remote-controlled AC power source. A remote-controlled 12-volt DC power source (such as a RIGrunner 4005) can also be used. 10Micron mounts cannot be turned on (and should not be turned off) by simply supplying power to the mount. Instead, after power is supplied to the mount, a timed signal must be “sent” to the mount to power up the computer. The mount computer – as with any computer – can be properly powered down in the same fashion, or it can be shut down through the virtual hand controller. Remote observatories rely on remotely-controlled power sources (AC or DC), often via internet, which can be utilized for turning equipment on and off. In this case the remote-controlled power source will be used to turn on (or off) the 10Micron mount. The remote switch is used by connecting the 12-volt DC power source to the “12VDC In” socket (2.1- by 5.5-mm standard power plug) and connecting the “10Micron Switch In” to the mount’s computer with the audio-style cable supplied with the mount. The switch is actuated by simply supplying power to the 12-volt DC power source, which then sends the appropriate timed signal required to turn on the mount. If a 12-volt AC/DC power source connected to a remote AC power supply is used, then Deep Space Products recommends energizing the AC/DC power supply for 10 seconds (or more), after which it should be turned back off (10 seconds is suggested to ensure that the AC/DC power supply has fully energized and powered the remote switch). With a direct 12-volt DC power supply, a 5.0-second (or more) power-on sequence should be sufficient, since that type of power supply usually supplies 12 volts immediately. The timed signal that the mount requires is 3.0 seconds long, so the remote switch needs to be powered for longer than 3.0 seconds. To shut down the mount (if not using the shut-down command in the virtual hand pad), the 12-volt DC power supply needs only to be energized again for 5.0 to 10 seconds, as above, for the mount computer to enter into its shutdown routine. The switch is constructed with an 80- by 54- by 23-mm (3.15- by 2.13- by 0.91-inch) durable aluminum case and weighs less than 4.0 ounces. The switch is warranted for 12 months. Custom switches that operate off a remote-controlled USB port/hub with individually activated USB sockets (i.e., 5-volt DC power) can also be supplied upon request. Visit here for more information.